It would be an understatement, to say the least, that Bud Greenspan is "quite a good filmmaker" or that he "specialises in Olympic documentaries." I first discovered Bud doing Salt Lake City. It is great to see that his standards have not wavered in his 91-minute Favorite Stories of Olympic Glory. 1) Nadia Comaneci's perfect 10 out of 10s - in a period where superstars Nellie Kim, Tourischiva and others dominated gymnastics, this 14-year old Romanian girl came out of nowhere to own everybody at the 1976 Montreal Games. 2) Aussie Duncan Armstrong's underdog victory in the 200 metre freestyle thanks to the rather insane regime and extreme (to say the least) personality of his coach, Laurie Lawrence. Lawrence's antics, borderline violence and near-clash with the South Korean authorities after his student won gold at the 1988 Seoul Olympics is well-documented here. I think this footage is a much watch for any sports fan - I have not seen a more passionate coach. 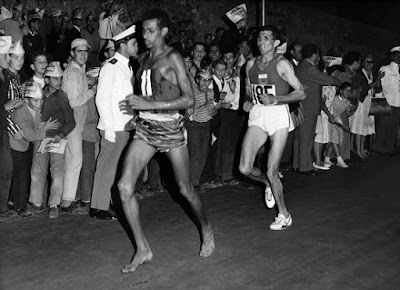 3) Abebe Bikila's barefoot marathon gold medal at the 1960 Rome Games -- Adidas sponsored the 1960 Games but they didn't have any shoes that fit him so Abebe decided to run barefoot just as he did in training. Bikila was a member of the Ethiopian emperor's palace guard and the first East African to win a gold medal. 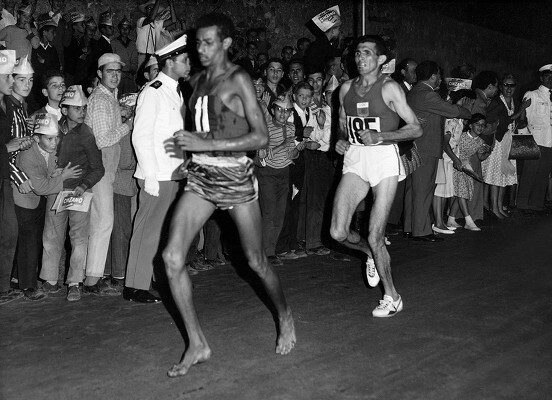 Bikila discovered shoes shortly after that and, no surprise here, the result was that no one could touch him in the 1964 Tokyo Games as well. This segment of the doco also covers the unfortunate case of a particular Japanese marathon runner, Tsuburaya, who committed suicide after he could no longer run as well as he would have liked due to lumbago. It is thought that the traditional Japanese WWII mentality of 'must not lose face' (in the context of running for his superiors and the Japanese people) coupled with what he perceived to be an embarassing last-minute concession of 2nd place at the 1960 Games, when a British Runner, Heatley, overtook Tsuburaya to consign Tsuburaya to Bronze, caused him to take his life. 4) The pure and raw power of Alexander Karelin of Russia, virtually undefeated in Olympic Greco-Roman wrestling (with 3 Gold Medals) until his first loss at the 2000 Sydney Games. 5) Dan O'Brien overcoming his abject and public failure of not qualifying for the 1992 Olympic decathlon despite being the favourite to take the Gold at Barcelona. O'Brien was even featured in commercial ads that pretty much stated that he was going to win the Gold for the USA. The hype that surrounded him was just plain ridiculous and, one can only imagine, overbearing. During qualification he failed to clear his first bar, as I understand it, in the pole vault. O'Brien actually said something to the effect that his failing to qualify was actually a huge relief -- a burden that had been lifted from his shoulders. However, incredibly, the happy ending is that O'Brien finally qualified for the 1996 Atlanta Games; he certainly did more than that though at those Games, consistently shrugging off the fierce competition across all events, which included overcoming his demons in the pole vault to secure Gold. Winning Gold in the face of such embarrassment and failure is incredibly admirable. You can probably guess that my favourite story is Abebe's story, although all the stories were very interesting. 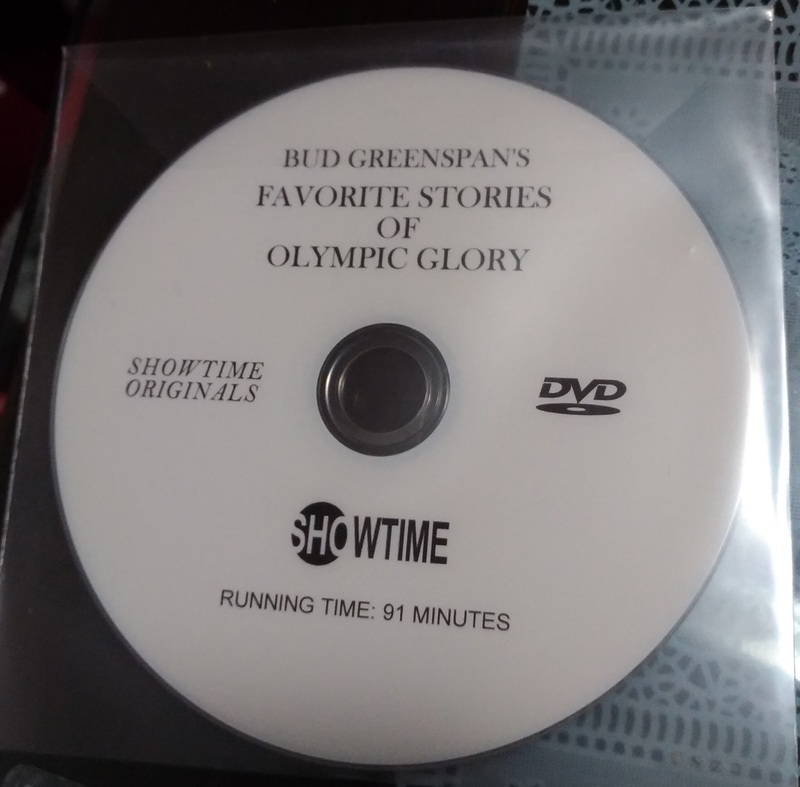 I would recommend this DVD to any sports or Olympic fan, but I understand this DVD is promotional only and can't really be purchased - but I did find it on eBay.